A distinguished career as an investigative reporter. Pfeiffer’s reporting for the Poughkeepsie Journal drew national attention in 2001 when she documented the suicides of mentally ill inmates in round-the-clock solitary confinement. As a 2004-2005 Soros Justice Media Fellow, she found systemic abuse in lockups across the nation, where people with bipolar disorder and schizophrenia were subjected to psychologically torturous isolation. Her October 2004 article in the New York Times Magazine, about the suicide of a 21-year-old mentally ill woman in solitary confinement, became the genesis of Crazy in America. For her Lyme reporting, Pfeiffer was honored with a half-dozen awards, including the prestigious Sigma Delta Chi award in 2013 from the Society for Professional Journalists, one of her two Sigma Delta Chi awards. For other reports, she has been honored by the Scripps Howard Foundation, National Headliner Awards, Inter America Press Association, Associated Press Managing Editors, the Gannett Company, New York City Deadline Club, Society of the Silurians, and National Council on Crime and Delinquency, among others. A tick found on Bushwick. Photos by Janet Graham Gottlieb. Born and raised in New York City, Pfeiffer graduated from Marist College in Poughkeepsie in 1976. She began her career at the Staten Island (N.Y.) Advance. In 1982, she joined the staff of the Poughkeepsie (N.Y.) Journal, where her investigative reports on New York State prisons won a dozen state and national awards from 2001 to 2006. Her articles in the 2010s exposed an estimated $15 billion in overpayments by the federal government to New York State institutions for the developmentally disabled. After Congressional hearings, the state revamped the funding system and forced New York to fulfill its promise to transfer residents to more humane homes in the community. In 2015, Pfeiffer left the Journal, which she credits with supporting her research in a way that few small news organization do. She is forever indebted. Pfeiffer is married to Dr. Robert Miraldi, whom she met when both were reporters at the Staten Island Advance. Miraldi, a Fulbright scholar and journalism professor, is author of Seymour Hersh: Scoop Artist. They have two children, four grandchildren and a Shih Tzu named Bushwick. 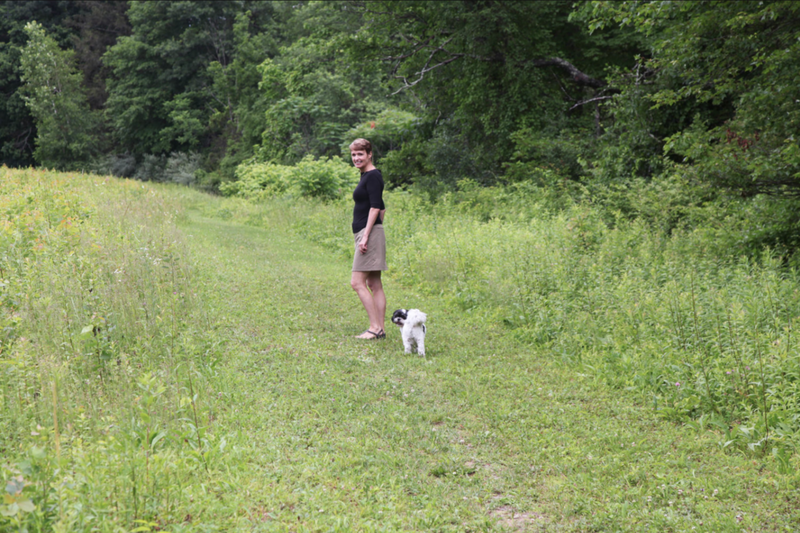 Mary Beth, with her Shih Tzu Bushwick, walks a trail across the lane from her upstate New York home.